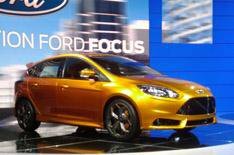 Ford Focus ST | What Car? With the all-new Focus only just out in the open, Ford is wasting no time in whetting our appetites for something faster with the ST.
Powered by a 247bhp 2.0-litre Ecoboost engine, the performance version of the Focus will be on sale in the UK late in 2011 or early 2012 roughly the same time as a new key rival, the Vauxhall Astra VXR. This fast Ford features a large rear spoiler and is more in-your-face than the ST it replaces. Take this new paint job, for example Ford calls it 'Tangerine Scream'. Very subtle. Performance details have yet to be released, but it should prove faster than the existing 221bhp car, which sprints from 0-62mph in 6.8 seconds. Close inspection of the interior reveals a six-speed manual gearshift and auto stop-start function. There are some familiar touches, too. The three dials inset on top of the dashboard are carried over from the previous-generation ST, showing information such as turbo- and oil pressure. There are going to be some high-tech options available, too such as wireless internet connectivity and blind-spot assist.